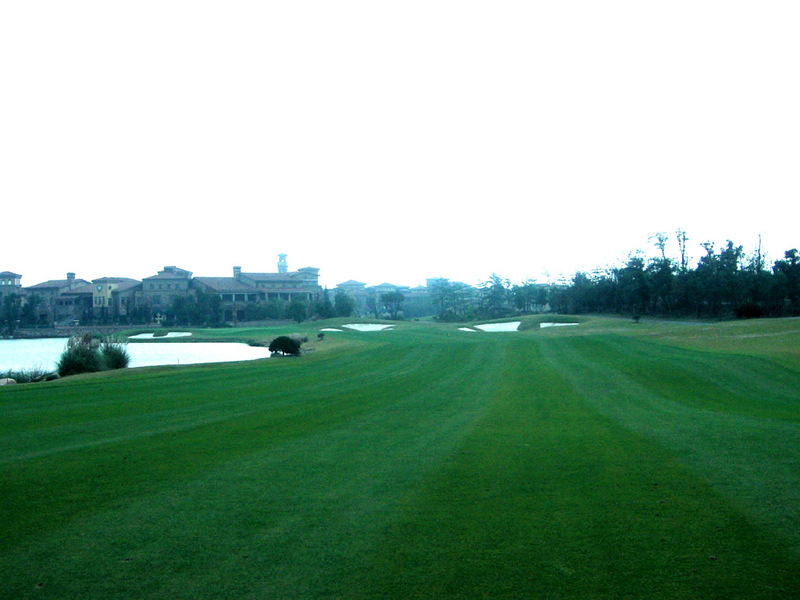 Sheshan International Golf Club is a top-notch golf course built on a gentle rolling hill. The punctuating and undulating tree-lined fairways, raised greens, water hazards and bunkers are all strategically placed in order to maximize the challenge. A strong technique and a decent course management are necessary in order to score well on this course. The course has a good mixture of both from easy and difficult holes ranging from short to long. 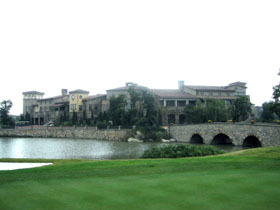 The Sheshan Golf Club proudly hosted the 2005 & 2006 HSBC Champions and guested many professionals including Tiger Woods. This helped boost the course’s publicity. 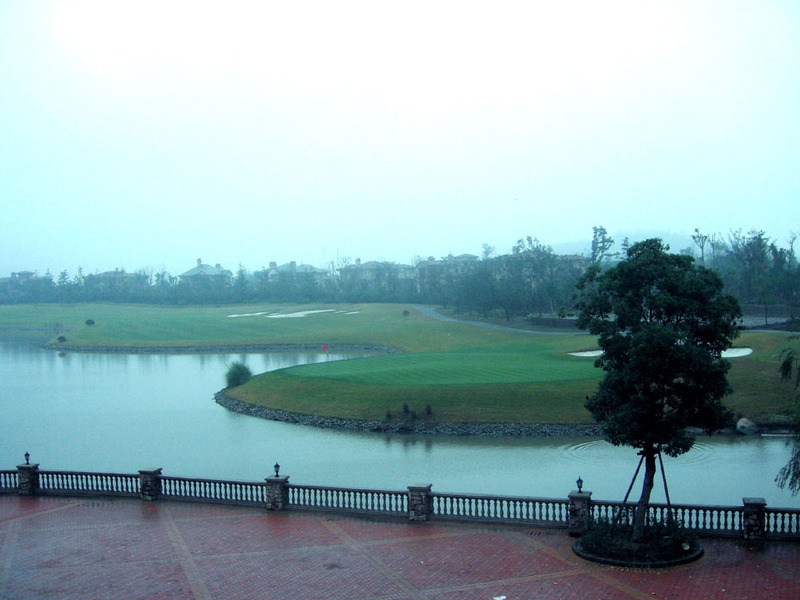 Unlike many of the golf courses in Shanghai, which are all relatively flat, this golf course moved a total of two million square yards of earth and sand in order to create large numbers of undulations. This par five consists of a sharp dogleg that bends to the right. The tee shot will require the ball to avoid the creek that guards the left side of the relatively narrow fairway. An accurate tee shot is necessary in order to avoid the row of six bunkers that are all lined up on the right side of the hole. In addition, the creek on the left hand side eventually leads into a lake that sits near the end of the hole. This will give the players some pressure in their second and third shots. This hole is an excellent mid-length par three that utilizes a natural river. The river runs alongside the left hand side of the hole. Players should look out for the relatively deep bunker that is placed in front of the green. The green is slightly elevated and slants from the mid left to the back right, meaning that the center of the green is a good target regardless of the pin position. The eighth hole is a long and downhill par five with a sharp dogleg that bends to the left. A creek runs along the entire left side of the fairway that eventually crosses in front of the green. There are two fairway bunkers that come into play off the tee. Players should avoid these bunkers in order to hit the green on regulation. The stream on the left tends to keep players aiming towards the right side. However, players will find their ball in the trees if they aim too much towards the right. The green is very shallow and undulated and is guarded by a body of water in front and a bunker in the back. I have heard that the green is reminiscent of Augusts 13th. This relatively long par four consists of a narrow fairway and a dogleg that bends to the left. The tee shot can be quite tricky due to the fact that the left hand side is covered with several trees, and the right hand side consists of bunkers that are placed between 240 and 290 yards from the tee box. The second shot can be quite challenging since players will need to hit and bite on the elevated green, which, from a distance, looks like its floating above the surrounding roughs. The fourteenth hole of this course is designed in an “S” shaped double dogleg. Although the tee shot can be quite a breeze, the second shot can get quite tricky and challenging. With water running down through the entire left section and well placed bunkers that are dug in throughout the fairway, players should try to be hit down the left side in order to open up a opportunity for an approach for the green. In addition, the green is slightly elevated and very shallow making this hole quite difficult. This very short but superb par 4 consists of a dogleg that bends to the right and a over-the-body tee shot. There is a large front bunker, and two back bunkers that are all strategically placed over the course of 250 yards. It is very tempting for long hitters to try aim ball on the green with one shot but players must be careful, as the green is small and surround by hazards. Therefore, players must make a decision whether go for the green or a lay up. It is said that Tiger Woods played this hole cleverly during the 2006 HSBC Champions. During his play, he used a number three wood club and managed to hit safely on the left side of the green with easy one chip and one putt. One the other hand, my favorite Japanese player, Hideki Matsuyama, ended up with a triple boggy on a 2014 tournament when his aggressive drive became lost ball. This two hundred and twelve yard long par three consists of an over-a-ravine tee shot. Players should look out for the bunkers that are placed on the left, right and backsides of the green. The green slopes sharply to the right; therefore player must aim accordingly to where the pin is located on that day. . The finishing hole is a dynamic par five that consists a dogleg that bends to the right, and a fairway that curves around a lake. In order to get the ball onto the green in three shots, the tee, second and third shots will need to carry the water. While long hitters can try to hit the green in two shots, the second shot must hit the green and bite, otherwise the ball could easily fall into a body of water that is strategically placed behind the green. For most players, a lay-up to 100 yards will leave a wedge short the semi-island green. In order to get to the Sheshan International Golf Club, it will take a 40-minute drive from Cetral Shanghai, a 30-minute drive from Hongqiao Airport and an 80-minute drive from Pudong International Airport. Visitors can book a tee time on weekdays only though a golf booking agent.